Please join the JAX Health Council and Florida Blue’s Market President, Darnell Smith as he highlights the organization’s longstanding commitment and achievement enriching Jacksonville’s Health. Learn how you can get involved and make a difference – ensuring a great future and high quality of life in our vibrant city of Jacksonville. 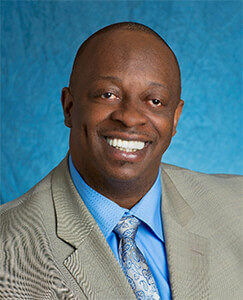 Darnell Smith is Florida Blue’s market president for the North Florida Region. In his role, Smith is responsible for Florida Blue’s business market growth, as well as customer and community engagement across 36 North Florida counties covering cities from St. Augustine to Pensacola. Prior to his current role, Smith was group vice president, Service Organization and Business Process Management Organization (BPMO). He was responsible for leading a team of approximately 2,000 people who provided service to more than 3 million customers and helped Florida Blue achieve market-leading customer satisfaction. He oversaw the company’s business process management strategy and execution through the deployment of Continuous Improvement and Six Sigma methodologies. Throughout his career, Smith has been very active in serving the community through numerous organization boards and councils, including United Way of Northeast Florida, First Coast YMCA, Sulzbacher Center, Communities in Schools Florida, Cathedral Arts Project and Feeding Northeast Florida. Smith has demonstrated leadership in developing the community through numerous board appointments including Jacksonville Chamber of Commerce, Economic Development Council of Tallahassee, JAXUSA Policy Council and Big Bend Minority Chamber of Commerce. Smith also served as 2017 Chair of the JAX Chamber Board of Directors. Smith holds a Bachelor of Science in Electrical Engineering from Florida State University. He is a graduate of the Advanced Management Program at Harvard Business School, the Advanced HR Executive Program at the University of Michigan and is an active member of Leadership Jacksonville and Leadership Florida. Health Council Members pre-pay– $22 Register Today! Please use this link if you are not a Member of the Health Council. Non-Members / Visitors / JAX Chamber Members pre-pay– $27 Register Today! If you have questions, please contact Jason Lafser, (904) 224-9911, or email jlafser@bdo.com.